Dynamic containers, introduced with PRPC 6.3, provide functionality similar to the Work Area control. Both Dynamic Containers and Work Area controls support the runtime presentation of work items and worklists in composite portals. However, Dynamic Containers are easier to configure, offer greater flexibility, and improve performance. Starting in the Pega 7 Platform, Work Area controls are supported but deprecated. As a best practice, upgrade Work Areas to Dynamic Containers. You can automatically upgrade Work Areas to Dynamic Containers with a single click. In addition, a caution message displays in the form header and the Guardrail report. If a Work Area control meets the requirements for automatic upgrade, then the Upgrade now button is enabled. 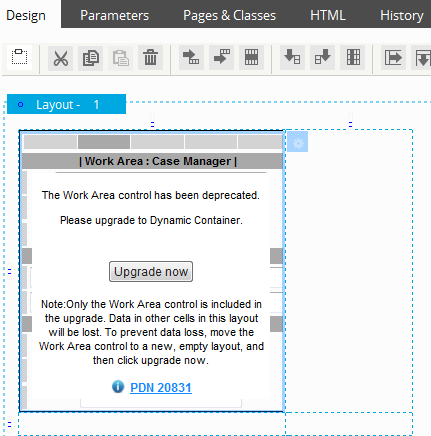 Click the Upgrade now button to upgrade the Work Area control to a Dynamic Container. The upgrade replaces the layout containing the Work Area control with a new layout that contains only the Dynamic Container and its contents. Only the Work Area control is included in the upgrade. Data in other cells in this layout is lost. To prevent data loss, if the layout that hosts the Work Area control contains additional data, move the Work Area control to a new, empty layout, and then upgrade the control to a Dynamic Container. The layout that hosts the Work Area control is replaced with a tabbed Dynamic Container layout or a single Dynamic Container layout, depending upon the configuration of the Work Area control. In most designs, it is a best practice to reconfigure the harnesses as sections. Using harnesses results in slower load times for each static tab and unnecessary thread creation and management, since each harness is opened in different thread. If data, other than the Work Area control, exists in this layout, move the Work Area control to a new, empty layout to prevent loss of data during the upgrade process. The Work Area is upgraded to a Dynamic Container. Notice the addition of the <<Dynamic>> tab. This tab is visible only at design time and enables you to configure properties of the Dynamic Container, such as the maximum number of tabs that can be open at runtime. For more information about Dynamic Containers, see the PRPC Help. Changes are recorded in the Description field on the section's History tab. The section containing the Work Area control is in an unlocked RuleSet. The Height parameter is set to Fill (not Sized to Content or Fixed). For single document (non-tabbed) Work Area controls, the Default Action parameter is set to Display. There are no Pega Web Mashup or similar. All harnesses are in the same class hierarchy as the section that contains the Work Area control. Exception: The system converts a harness in a different hierarchy if it has only one section, which has a Page Name in the harness's Pages and Classes setting (this value is copied to the new section's Pages & Classes tab).